MEMPHIS, Tenn. -- If you think you were hurt by the stock market, think about what happened to Elvis Presley. ... So you don't care what happened to Elvis Presley? But you would care if you stopped by at Graceland, which 700,000 people do every year, one-quarter of them foreign-born. So that's all very interesting, but why the economic blues? Did they cause him to sing a song or whatever about how lonesome he became one day after his market went down? Slow down -- even if you care not at all about Elvis Presley, never listened to one of his songs; or if you did, certainly didn't intend to listen to another. Yes, he was an important musical figure, but he blanked out in the mid-'70s from drug-bloat, so why can't we get on with somebody else? We can and do, but how to account for 700,000 people going to Graceland every year? And here's something else. He died on Aug. 16, 1977, and a year after that, a few fans began to congregate on the eve of the anniversary of his death, carrying, each one, just one candle. They would walk up and down in front of Graceland. But in 1981 the property was opened to guided tours, so beginning then, the candlelight vigil made its way in and around the Graceland preserve, passing by the little graveyard where Elvis is buried, alongside his father, mother and grandmother. What nobody was able to control was the number of people who came by with lighted candles. Jack Soden, who is the chief executive officer of the Graceland operation, tried trimming the crowd down, but after a few years had no alternative than to permit the earliest arrivers to begin their walking vigil at 5 in the afternoon. By dawn the succeeding day the pathways were drenched from the wax of the memorial candles. Are they older people? Elderly folk who just never got over the Elvis they grew up with? 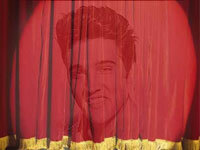 After all, he was born in 1935, became famous in 1954 -- are these old baby-boomers who come to Graceland? You'll have guessed that the answer is No. There are still many teen-agers who come every day. Graceland doesn't anticipate ending its operation when contemporaries of Elvis die off, which will begin to happen about 10 years from now. percent. Well, those royalties now earn $25 million per year. The bummest deal in musical history. 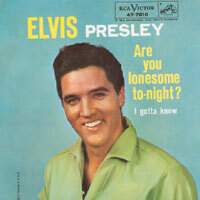 extension of Elvis' resoundingly vulgar tastes? A silly question. Why do people want to poke into the spot in the warehouse where the killer waited for President Kennedy? Why the allure of the balcony on which Martin Luther King strolled, awaiting the fatal bullet? Elvis Presley is something of a legend, and it is in very full display at Graceland. There is his pink Cadillac, and his motorcycles, and his big jet airplane and his little jet airplane, and the costumes he wore, which would have dazzled the pharaohs, and the tractors he bought, having zero use for them -- he just wanted to have a few tractors. But there also, in dazzling numbers, are the gold records he won from the industry. What seems thousands of them, authentic memorabilia of a voice and manner and style that dumbfounded, enthralled and repelled the largest musical audience ever got together by a single musical artist. What are they there at Graceland to venerate? A relevant thought, on the Christian holy week. An aspect, perhaps, of the spiritual inclination of the American people, who do not require that the memory being venerated should have been a martyr or a prophet. Just someone truly singular and mythogenic, who contributed to his own legend his suicidal ending as a victim of the drugs he inveighed against with the strange, disquieting, appealing innocence that marked his entire life.